Here's a different twist on the popular halo setting. This client had an oval solitaire engagement ring. Her idea was to add her children and grandchildren's stones around her center; almost forming a 'family circle' around her diamond. Luckily the halo had just the right amount of settings so each person had 2 stones. 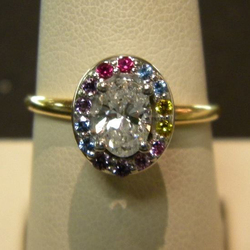 The halo was added to her existing ring and her center diamond reset. Do you have jewelry that needs a style upgrade? Take a look at our Custom Design Gallery for some inspiration, or stop in today to talk to our trained, knowledgeable staff and create your very own custom designed piece!